74,000 years ago, the Earth experienced the largest volcanic event of the last two million years when a supervolcano beneath Lake Toba in northern Sumatra erupted with a Volcanic Explosivity Index intensity of 8 (“Ultra-Plinean”), ejecting 2,800 km3 of magma, with around 800 km3 of this falling as ash. In comparison, Krakatoa, Tambora and Mount Pinatubo would have seemed like firecrackers. Much of the ash was blown north-west by the wind and the Indian subcontinent and part of the Malay Peninsula were blanketed in ash. Now known as Youngest Toba Tuff (YTT), these deposits ranged in depth from 15cm to as much as 6m at one site in Central India. The effects of the explosion would have been to cause a “volcanic winter”, during which temperatures worldwide may have fallen by 3-5 degrees Celsius for several years. In 1998, Stanley H Ambrose suggested that the eruption caused a bottleneck in human populations (Ambrose, 1998). Geneticists Lynn Jorde and Henry Harpending believe the world population of anatomically modern humans fell to as few as 5,000-10,000 individuals. Could this really have happened; could Homo sapiens really have teetered on the brink of extinction? In the aftermath of the eruption, conditions for life would have become very harsh and the Indian subcontinent would certainly not have been the healthiest of places to be! But were any anatomically modern humans there? The first evidence of Homo sapiens outside of Africa are the 110-90,000 year old fossil remains found in the Levant. This migration seems to have petered out; the migrants either died without issue or (less likely) returned to Africa. The migration(s) believed to have given rise to the world’s present-day non-African population occurred much later. Estimates vary as to the timing, with some authorities claiming it was as long ago as 80,000 years ago but most opting for between 50-60,000 years ago, long after the Toba eruption. Stephen Oppenheimer is among those who do believe that modern humans were already in India and Malaysia when Toba erupted. He believes the migrants left the Horn of Africa 80,000 years ago. Oppenheimer claims the Toba eruption resulted in the extinction of human life in India, leaving a “genetic furrow” that is visible in Asia’s genetic record to this day. This arose as the subcontinent was repopulated by settlers from both East and West Asia. Although descended from the same root lines of the single exodus, Indian maternal branch genetic (mtDNA) lines are completely different from those of the Far East and mostly different from those in the West. Oppenheimer also draws on archaeological evidence from Kota Tampan in the Lenggong Valley, Malaysia where stone tools were found in the 1960s. These were covered by volcanic ash, now known to be from the Toba eruption. The large pebble-tools, fashioned on one side only were thought to be the work of an earlier human species but in the absence of fossil remains the matter could not be settled one way or the other. Work by Prof. Zuraina Majid, of the University of Science in Penang suggests that the local pebble-tool culture may have persisted continuously right up until only 7,000 years ago. If so, the possible implication is that the earlier pebble-tools were actually made by modern humans. Support for this view came in 1990 with the discovery of Perak Man, a 10,000 year old anatomically-modern human found in the same context as the pebble tools (Oppenheimer, 2003). But not everybody accepts the bottleneck theory. Gathorne-Hardy & Harcourt-Smith (2003) point out that if Toba has caused a bottleneck in the human population, it would have also affected other species, especially other, more environmentally sensitive taxa with more specialised ecological requirements. These would have been expected to suffer at least a similar population crash leading to many becoming extinct. But there is no evidence for mammal extinction associated with Toba. In 2007 dramatic evidence was presented that suggested that not only were modern humans in India at the time of the Toba eruption, but that they survived the catastrophe. A team led by Michael Petraglia of the University of Cambridge recovered stone artefacts from both above and below the 2.55m thick ash deposit near Jwalapuram, in the Jurreru River valley of southern India. 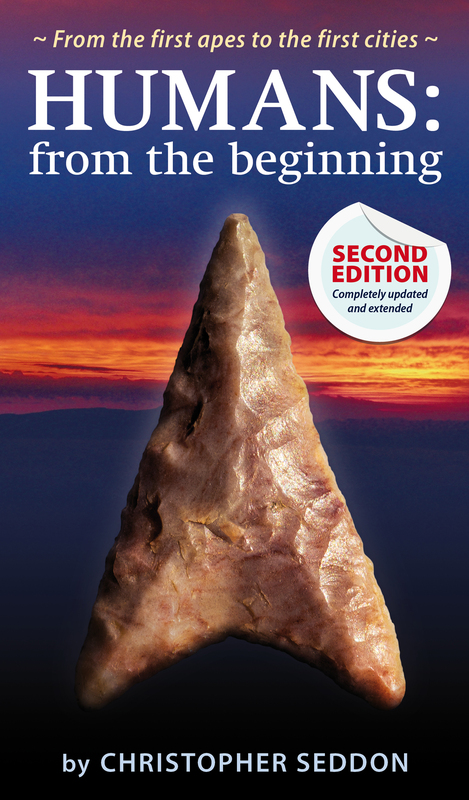 There appears to be a strong element of technological continuity between the two sets of artefacts and together with the presence of faceted unidirectional and bidirectional bladelike core technology, they suggest closer affinities to African Middle Stone Age traditions such as Howieson’s Poort than to those of the contemporaneous Eurasian Middle Paleolithic. The latter are typically based on discoidal and Levallois techniques. This, together with the behavioural flexibility needed to survive the catastrophe, suggests that modern humans were already in India at the time of the eruption (Petraglia et al, 2007). In addition, there are recent genetic studies that do support the presence of modern humans in India 74,000 years ago (Kivisild et al, 2003; Metspalu et al, 2004). Petraglia’s interpretations are also a problem for the Kota Tampan pebble tools being made by modern humans. If the Indian settlers were using a technology derived from the African MSA, why were their counterparts in Malaysia using far more primitive tools? Human remains found in the context of ash from Toba are the one thing missing; the matter cannot be considered to be settled until such time as these come to light; but on the balance of probabilities it does seem likely that the effects of the Toba eruption were not as deleterious as some have supposed. Kivisild T, Rootsi S, Metspalu M, Mastani S, Kaldma K, Parik J, Metspalu E, Adojaan M, Tolk H-V, Stepanov V, Golge M, Usanga E, Papiha S S, Cinnioglu C, King R, Cavalli-Sforza L, Underhill P A & Villems R (2003): The Genetic Heritage of the Earliest Settlers Persists Both in Indian Tribal and Caste Populations, Am. J. Hum. Genet. 72:313-332. Oppenheimer S (2003): Out of Eden, Constable. Michael Petraglia, Ravi Korisettar, Nicole Boivin, Christopher Clarkson, Peter Ditchfield, Sacha Jones, Jinu Koshy, Marta Mirazón Lahr, Clive Oppenheimer, David Pyle, Richard Roberts, Jean-Luc Schwenninger, Lee Arnold, Kevin White (2007): Middle Paleolithic Assemblages from the Indian Subcontinent Before and After the Toba Super-Eruption, Science 317, 114.